Philip E. Kaplan has practiced in the area of employment law, civil rights, and business litigation since his licensing by the Commonwealth of Massachusetts in 1962. From 1962 until 1967, he was a field attorney with the National Labor Relations Board in St. Louis. In January 1968, he was licensed to practice in Arkansas, when he became associated with the firm of McMath, Leatherman, Woods & Youngdahl. In 1969, he left that firm to continue his practice of employment law and civil rights law with the firm of Walker, Kaplan & Mays, where he remained a principal until December 1977. From 1978 until August 2007, Mr. Kaplan was a principal with the firm of Kaplan, Brewer, Maxey & Haralson P.A. The firm had an extensive litigation practice, primarily in the area of employment law, commercial litigation, and family law. Mr. Kaplan joined Williams & Anderson PLC in 2007. Mr. Kaplan is a member of the American Board of Trial Advocates (ABOTA), the American College of Trial Lawyers (ACTL), and the American Academy of Appellate Lawyers (AAAL). He was a long-time adjunct law faculty member at the University of Arkansas at Little Rock William H. Bowen School of Law, where he taught trial advocacy. He has been a member of the Board of Governors of the Arkansas Bar Association and the Chair of that organization. 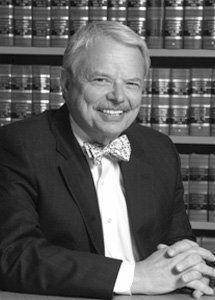 He is an emeritus member of the William Overton Inn of Court and a member of the Pulaski, Arkansas, and American Bar Associations. He is a Fellow of the American Bar Association Foundation. Mr. Kaplan began his activity in class action cases when he was appointed to be the attorney for the inmate population of the Arkansas prison system, where the court ultimately declared the entire prison system unconstitutional. Mr. Kaplan appeared before the United States Supreme Court in his capacity as attorney for the inmates in the case of Finney v. Hutto, which resulted in a declaration establishing the constitutionality of 42 U.S.C. § 1988, the civil rights attorney fee act. He has most recently been lead counsel for a Fortune 10 company in a nationwide class action. Mr. Kaplan was also lead counsel on behalf of the University of Arkansas and its Board of Trustees in a challenge by the terminated head basketball coach in the matter of Richardson v. Sugg et al. He has throughout the years represented local, regional, and national companies on matters involving employment discrimination cases, non-competition agreements, and stock purchase agreements. In addition to his extensive trial work, Mr. Kaplan has successfully argued many cases before the United States Circuit Court of Appeals for the Eighth Circuit and the Arkansas Supreme Court. Mr. Kaplan received an A.B. degree from Harvard University in 1959, and an LL.B. degree from the University of Michigan in 1962. Mr. Kaplan is listed in Best Lawyers in America under Appellate Law, Bet-the-Company Litigation, Commercial Litigation, First Amendment Law and Labor and Employment Law; in Chambers USA as a “Leader” in the field of General Commercial Litigation and Labor & Employment Law; and in Mid-South Super Lawyers in the areas of Employment and Labor Law and Business/Corporate Law.